Amateur astronomer Igor Cekalin, of Russia, won the European Southern Observatory's Hidden Treasures 2010 astrophotography contest with this image of M78 nebular complex in the constellation Orion. A cosmic photo contest has given amateur astronomers the chance to draw out the hidden beauty of the universe and the results are spectacular. Last week, the European Southern Observatory announced the winners of its Hidden Treasures 2010 astrophotography contest. The competition invited amateur astronomers to dig through ESO's vast archives and transform raw, gray-scale telescope observations into gorgeous full-color images of space. Igor Chekalin, from Russia, won the grand prize — a trip to ESO's Very Large Telescope in Paranal, Chile. 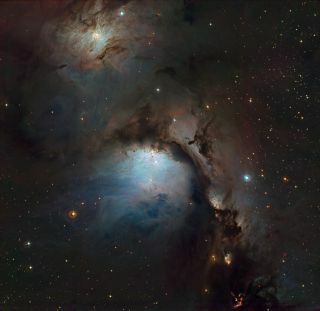 His prize-winning pictureis a stunning shot of the M78 nebular complex in the constellation Orion. Chekalin also submitted the second-highest-rated image, which depicts the galaxies NGC 3166 and NCG 3169. The galaxies NGC 3166 and NCG 3169 in this image by amateur astronomer Igor Cekalin, of Russia, who won the European Southern Observatory's Hidden Treasures 2010 astrophotography contest. This image won second place. But judges were impressed by the talent and dedication on display in all of the nearly 100 entries. "We were completely taken aback both by the quantity and the quality of the images that were submitted," Lars Lindberg Christensen, head of public outreach and eduction for ESO, said in a statement. "This was not a challenge for the faint-hearted, requiring both an advanced knowledge of data processing and an artistic eye. We are thrilled to have discovered so many talented people." Many hours of work are required to assemble raw telescope data into polished, colorful images, ESO officials said. The raw images must be corrected for distortions and unwanted signatures of the instrument, and enhanced so as to bring out details hidden in the astronomical data. Professional astronomers know how to do this — and so do some amateurs, as the Hidden Treasures competition made clear. The amateurs sifted through many terabytes of ESO data, charged with creating a finished image that would reveal the hidden beauty of our universe. Chekalin, the overall winner, gets a guided tour of the Very Large Telescope, as well as the opportunity to participate in a night’s observations. Runner-up prizes included an iPod, books and DVDs. And the highest-ranked photos will be released for the world to see on www.eso.org as Photo Releases or Pictures of the Week, according to ESO officials. The ESO jury evaluated the entries based on the quality of the data processing, the originality of the image and the overall aesthetic feel. Since several of the top-ranked images were submitted by the same people, the jury decided to make awards to the ten most talented participants, so as to give more people the opportunity to win a prize, ESO officials said.